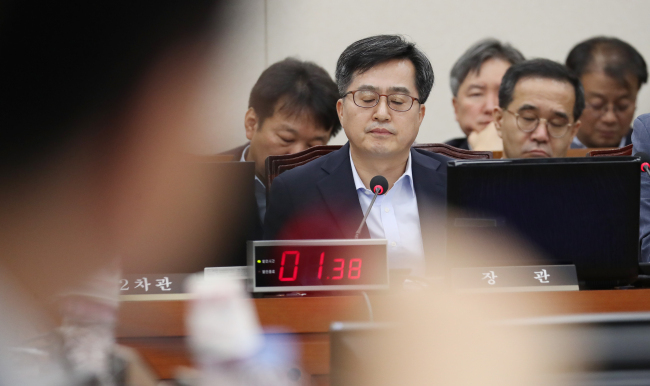 The apparent discord between the country’s top two economic policymakers -- Deputy Prime Minister and Finance Minister Kim Dong-yeon and presidential chief of staff for Policy Jang Ha-sung -- seemed to die down over the weekend as Cheong Wa Dae firmly dismissed rumors of Kim’s resignation. However, uncertainties persist over the cooperation between the two officials as they seem to remain at odds over the government’s economic agenda amid worsening employment figures. “(The resignation of a minister) would have to be delivered directly to the president, but no such report has reached the president,” the Blue House spokesperson Kim Eui-kyeom told reporters Friday. The presidential office’s denial came in response to an earlier report that Minister Kim had offered his resignation the previous weekend. The spokesperson’s remarks were echoed by officials of the Ministry of Economy and Finance. “(The government’s) initiative of income-led growth will remain on track,” the Blue House spokesperson added, hinting that both Kim and Jang would keep their current positions despite an imminent reshuffle. The Moon Jae-in administration is set for a sweeping reform of the Cabinet and the presidential secretariat as early as in a week’s time, marking the second phase of the incumbent administration since kicking off in May last year. Speculations had been rampant until recently that either Kim or Jang might step down. “I shall take responsibility for the economic performance and challenges, if necessary. I am ready to take responsible actions at a time that meets the people’s demand,” Minister Kim had said in a parliamentary committee meeting Thursday. This was not the first time that the top economic policymaker found himself in a tight corner over the nation’s worsening employment and income distribution situation. In late May this year, President Moon urged Kim for tangible efforts to realize “innovative growth,” while highlighting that the income-led growth initiative and the minimum wage hike mostly had positive consequences. The president’s comments had triggered rumors that Kim might step down, as the latter had repeatedly spoken strongly about the downside effects of the drastic wage hike, raising skepticism toward the income-led growth policy. In the face of worsening employment figures in July, the ministry and the presidential office had been at odds. Minister Kim had suggested that “improvements or changes (in economic policies) may be considered” in response to the job market situation. On the other hand, Jang displayed a more confident stance, asking the nation to “trust the government and be patient. Mounting speculation of the discord between Kim and Jang has weighed down on the Moon Jae-in administration, which has pledged to achieve a “people-centered economy” through income-led growth, innovative growth and a fair economy. Kim has appeared to spearhead the area of innovative growth, while Jang is considered the master mind of the income-led growth model. Fair Trade Commission Chairman Kim Sang-jo has taken charge of creating a fair economy.